New York City with its nearly 8 500 000 inhabitants is one of the largest metropolis in the world. 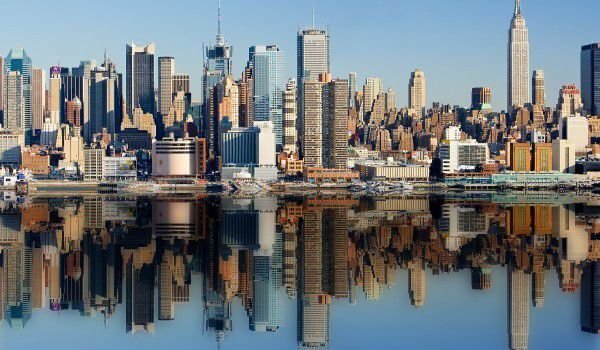 There is hardly enough words to describe New York there are a vast diversity of cultures, customs, modern urban life and national historic monuments, which are collected on the substantial area of approximately 1 214 square kilometers which makes New York. The first European settlers in the area of New York laid the foundations of the Dutch settlement in the southern part of Manhattan named New Amsterdam. According to popular legends the whole island was eventually purchased by local Indian tribes against a handful of trinkets. Later, the colony passed into the hands of England and was named New York in the name of the new King James, who was Duke of York. After the American Revolution, New York served as the capital for a short time. In the 19th century emigrants flooded New York and contributed to the significant expansion of the city. Roughly at the time the orthogonal network of streets and Avenues was planned, which is now a nice architectural feature of New York. Over 50 years later still in the 19th century was corn the idea for the first of its kind, Central Park, which has now become a symbol of the city. Since 1886 millions seeking a new life are greeted by the Statue of Liberty. It wasn’t until the early 20th century the progressive municipal manager of New York merged with parts of neighboring Westchester (Bronx), Kings (Brooklyn), Queens and Richmond (Staten Island). Today in the composition of New York includes Brooklyn, Bronx, Manhattan, Queens and Staten Island. 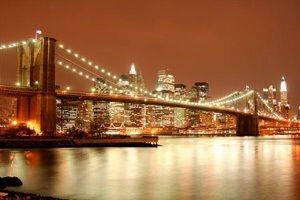 In 1883 the Brooklyn Bridge was completed, linking Manhattan with the then independent city of Brooklyn. During the first quarter of the twentieth century New York became the world's commercial and industrial center. After the Great Depression in New York one of the tallest skyscrapers in the world was built, the Empire State Building is considered one of the Seven Wonders of the Modern World as with the Golden Gate Bridge in San Francisco. So grand and serious, the Empire State Building is located in Manhattan. This is the emblem of the New York civil engineering achievement in the U.S. state named after the same name, formerly called, Imperial state. The building of the Empire State Building is located on Fifth Avenue № 350, between 33rd and 34th streets. The construction of the Empire State Building was designed by architectural firm Shreve, Lamb and Harmon. The Empire State Building is the second tallest building in the United States after the Sears Tower in Chicago, Illinois. The skyscraper in Manhattan was built in art deco OIB, and was officially completed in 1931 and opened on a solemn ceremony by the then the President of U.S. - Hoover. The Empire State Building is the record because it is the first building in the world that exceeds 100 floors. For 41 years giant targets became equal in height in New York , until the two towers of the World Trade Center where shifted leaving the Empire State Building in its place of honor. After the impact against the two towers on September 11th, 2001 the Empire State Building once again is considered the tallest building in New York. The spectacular size of the Empire State Building includes 102 floors, reaching a height of 381 meters. Adding the broadcasting antenna the height of the Empire State Building is 448 meters. The 102 storey tower has 6, 500 glass windows and 73 high speed elevators serve workers and visitors to the tower. The Empire State Building occupies a total area of 200 000 square meters and was built with 330 000 sq m of concrete. The Empire State Building was built in record time of 775 days; the giant is the result of rivalry between the car companies, Chrysler and General Motors for raising the highest building. Over 30 years of the last century, the end result and the emergence of such a structure did not exist anywhere else in the world and cost around 41 million dollars. To this day construction and renovation of the internal mechanisms of the Empire State Building is constantly updated with only the last six years for innovation inputs are given over 67 million dollars. The building now houses offices, banks and famous observatories, published on 86th and 102th floor, where you can catch the detailed and breathtaking views of the entire New York. Millions of tourists visit the Empire State Building each year. On May 1st, 2006 the building celebrated 75 years of construction. The second floor of the tower offers one of its main attractions. The simulator, which was opened in 1994 is a ride not to be missed taking up to about 25 minutes and gives you an almost real aerial tour around New York. As one of the emblems of the largest U.S. city, the Empire State Building is often used as background images for very large scale movie productions. Probably one of the largest representations of the huge tower is in the film King Kong in 1933. The scene in which the huge monkey climbs to the top to escape from his captors. On the 50th anniversary of the band in 1983 the Empire State Building was decorated with a giant inflatable monkey itself. The Empire State Building is still an architectural masterpiece. 1951 New York became the headquarters of the United Nations. In the 80's, the Wall Street plays a major role in transforming New York into a global financial center. Manhattan Island is the part of New York , which can definitely be called the most active and most lively. Manhattan is the largest commercial, cultural and financial center in America and one of the most advanced in the world. It is concentrated in most places and most commercial streets, and some of the tallest buildings in the world, including The Empire State Building and the twin towers of the World Trade Center who were victims of the September 11 attacks, 2001 are located there. Brooklyn and Queens are on Long Island and were the most populous area. New York is situated in the archipelago of islands on the East Coast of North America, forming an excellent port, which is the primary cause of its foundation. Hudson River, which flows as a tidal estuary in New York Bay separates the Bronx and Manhattan from New Jersey. 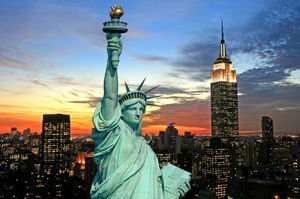 Undoubtedly one of the greatest historical and cultural sites are not only in New York but all over the U.S. like the Statue of Liberty and Ellis Island. These are symbols of the American culture, American Dream, American ideals of fairness and independence and are united within the National Park Statue of Liberty. The statue itself was built in 1886. To seal the alliance between France and America. The emblem of the United States stands on Liberty Island and welcomes each of the visitors. The Statue of Liberty was created by the sculptor Frederic Auguste Bartholdy, who partnered with the project architect of the Eiffel Tower - Gustave Eiffel Alexandre. The article on freedom in New York was completed in 1886. During 1986, after its major renovation, the grand state emblem is a monument of world heritage by UNESCO.